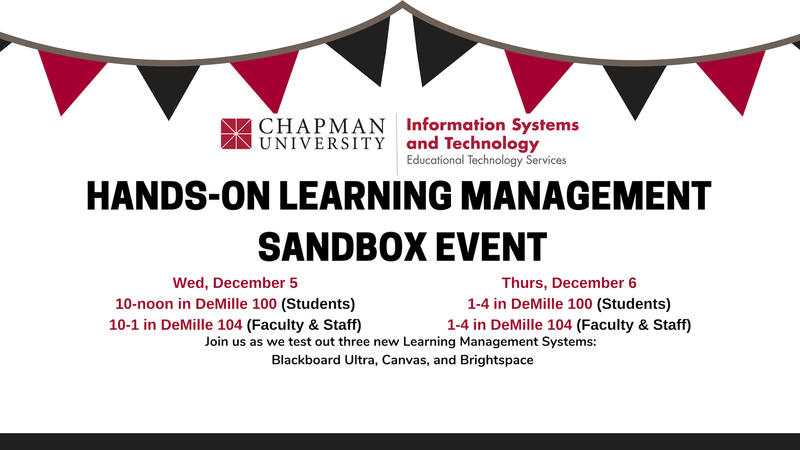 On Dec 6, between 1pm-4pm, the Tech Hub will host an LMS Review Sandbox Event. There will be three (3) rooms, three (3) support staff, and three (3) LMSs -- Bb Ultra | Brightspace | Canvas. Choose to try one, two or all three Learning Management Systems! Note, sessions repeat again at 11:30 am, with schedule subject to change depending on audience questions and requests. At the end, leave with your own LMS sandboxes to further experiment with the three modern learning environments! You can contact the event organizer, Sheryl Hathaway at shathaway@chapman.edu.